Ghosting and how to prevent it. “Ghosting” refers to a phenomenon that occurs when photographing moving objects while using flash. There are actually two kinds of ghosting and understanding the difference and which one you are seeing will help you to determine how to get rid of it: for the purpose of this article, ghosting will be treated as something to eliminate from your hummingbird photos. First, lets distinguish ghosting, a form of motion blur, from motion blur generally. Motion blur occurs as a result of the movement of the subject during the time that your shutter is open and during the time that it is illuminated by the primary light source. 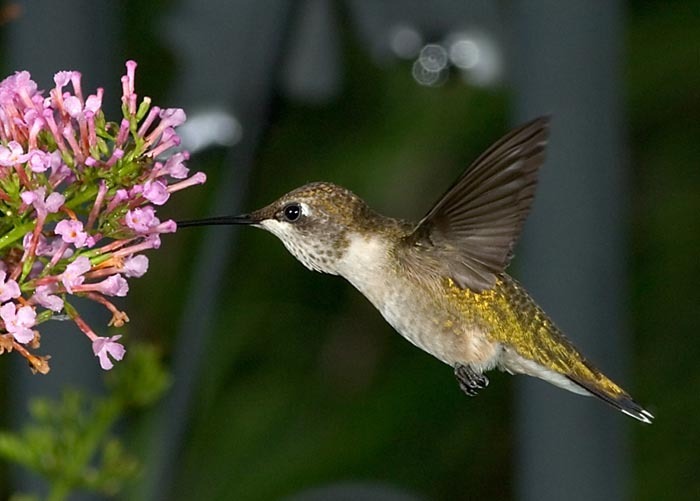 With hummingbirds, the classic example is blurred wings. Your camera captures these as a blur because it captures the image of the wings during the course of movement. The blur will consist partly of just the moving wings, and partly of a blend of wings and the background that was partly visible and partly obscured during the exposure. Ghosting primarily occurs with flash so lets talk about cameras and flash units for a moment. My camera, a Canon EOS 10D, has a maximum flash sync speed of 1/200 second. It is an SLR. The way that the shutter in most 35mm and digital SLR’s work is through the use of two “curtains.” The first curtain slides open across the film plane. Then the second curtain follows it, closing the "curtain." Imagine a stage with two curtains that are each long enough to stretch completely across a stage. They meet on the left side of the stage so that only one curtain is actually blocking your vision of the stage. When the play or concert starts, that one curtain slides all the way across opening from the left to the right. When the curtains are "open," both curtains are bunched up at either side of the stage. When the curtain closes, the curtain on the left slides all the way across, following the first curtain, and blocks the view of the stage. An SLR’s shutter works this way, though it may actually travel vertically. The first curtain opens and then, after an appropriate delay the second curtain follows. For very high shutter speeds, the second shutter curtain may begin closing before the first shutter curtain has completely opened. In that scenario, the entire film plane will never be exposed all at once. This is what necessitates a maximum flash sync speed, but lets talk about how flash units work first. Flash output is fairly uniform. That is, a flash, while “on,” shines at a fairly constant level of brightness. The way that total flash output is controlled is by turning the flash on and then turning it off when it has emitted enough light to expose the image properly. This is done very quickly. In fact, most flashes, even when used at “full power” are only "on" for 1/1000 second or so. When at one half (1/2) power, the flash is only turned on for half the time. When at one quarter power, only for one fourth (1/4) the time, etc. The brightness is always the same, the flash is just allowed to shine for varying amounts of time. At the lowest power settings, some flashes only shine for 1/30,000 second or less. Flash units are typically turned on at the point where the first curtain of the shutter reaches the fully open position. In order for the flash to expose the image properly and evenly, the second curtain must not start to close before the flash has turned off. Therefore, a maximum flash sync shutter speed will be the highest shutter speed at which the delay between the first curtain reaching the fully open position and the second curtain starting to close is long enough to allow a flash to complete its firing (turn on and turn off) at its full power setting. Ghosting, as opposed to general motion blur, is an effect caused by the movement of the subject during the time that the shutter is open but the flash is not on. The flash may perfectly capture the bird, but if there is enough light on the bird, or if the background is bright enough, the movement of the wings after the flash is turned off, but before the shutter closes will result in either the blurred image of the moving wings (in the case where there was enough light on the bird to register on the film or sensor) or a shadow caused by the “dodging” of the background by the wings or a combination of both. Note the ghosting in the tail and rump area. 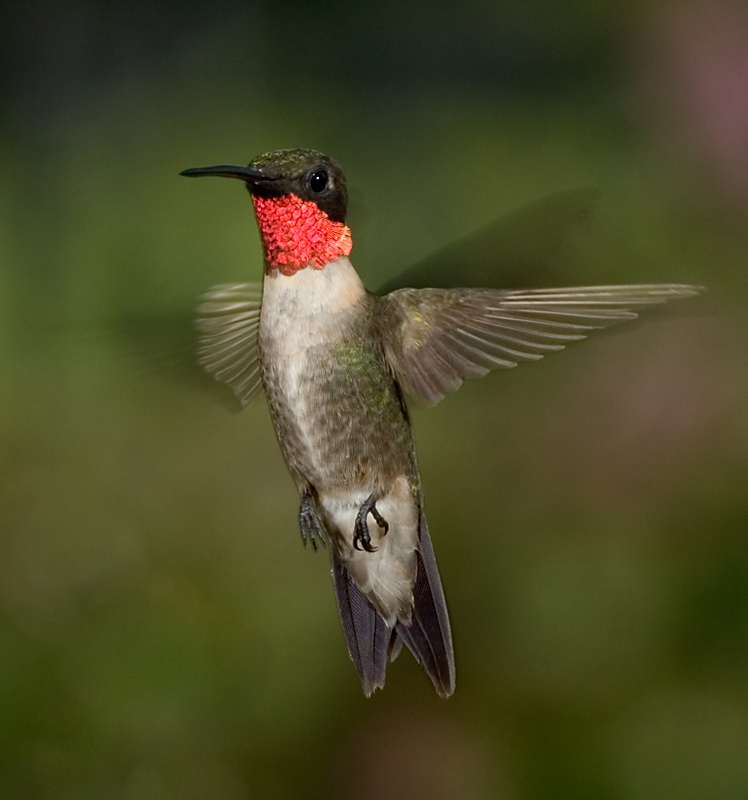 When using flash to illuminate the hummingbird, the way to avoid this form of ghosting to is to have the hummingbird as shaded as possible and completely out of direct sunlight. Additionally, the more the reliance on the flash for the illumination of the bird, the less prominent this form of ghosting will be. This means, the faster the shutter speed, the smaller the aperture, the lower the ISO, the more flash units you use, the higher the output of those flashes and the lower the amount of ambient light, the less likely your image will have ghosting caused by ambient light. As you can see, there are a lot of variables. The best strategy is to take photos in as dark a shade as possible and use as many flash units as you can so you will have a relatively high light output from flash. This will allow you to use a smaller aperture and a lower ISO. The second type of ghosting is caused by the “dodging” of a bright background by the wing movement after the flash has turned off (or before if you are using second curtain sync). 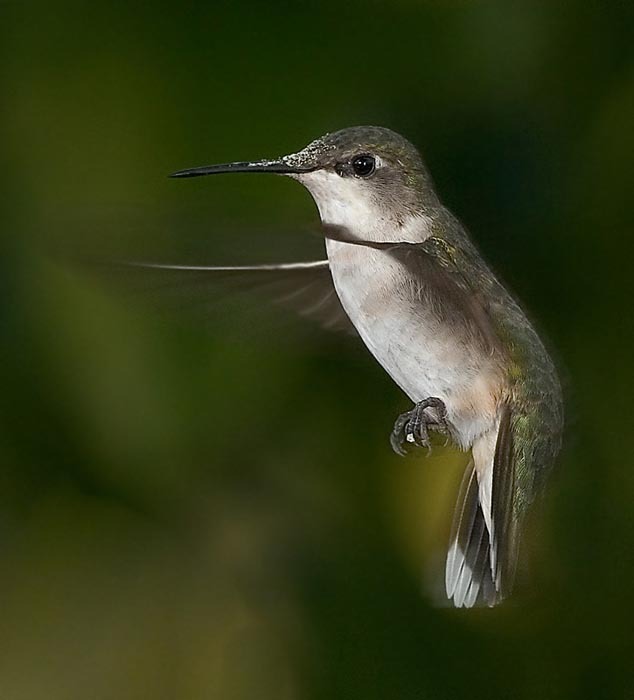 With this form of ghosting, the hummingbird is not creating an image on the sensor or film. What is happening is that the hummingbird’s wings are blocking light coming from a background that is much brighter than the bird during the time that the flash is off. This creates a sort of shadow of the wings against the background such as in the following image. Notice the dark ghosting around the wings. There are basically three ways to avoid and/or minimize this sort of ghosting when using flash. First, you can underexpose the background. This is very effective but results in photos where the background is black or very dark. Second, you can use flash as the primary means of lighting the background. This is also very effective, but can only be done if the background is also shaded and, unless the background is very close to the bird, might require a separate flash (see the wide area flash method on my lighting methods page for an approach of this sort). Finally, the third method is to use the “high speed sync” function of a dedicated flash and use a fast shutter speed. This works, but usually results in wing blur, the avoidance of which may be the reason that you wanted to use flash in the first place. When the entire scene is primarily illuminated by multiple flash units, ghosting of all types can be almost totally avoided. In the following example, there is practically no ghosting whatsoever. Entire scene illuminated by 4 flash units. In the above image, everything in the image was illuminated by flash. The drawback to this method is that images taken using these settings will almost always look as if they were taken at night. Parts of the background will be dark. You can avoid this by having a close background that has no gaps or by using a backdrop of some sort that is illuminated by flash, or you can use a combination of both. Some photographers use a blue mat-board or poster board behind a plant to make the background gaps in a plant seem to show blue sky. A separate flash usually is dedicated to the blue backdrop. In my experience, the second type of ghosting is the most common and can be very difficult to avoid if you want a background that is not black and you want to use flash. 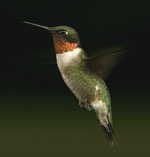 This sort of ghosting can give black "borders" to the hummingbird's body if long shutter speeds are used because of slow max sync speeds or to properly expose the background.